Cabernet Sauvignon and grilled steak sounds like a cliche. Sometimes when a food and wine pairing is a match made in heaven there is no good reason to complicate it. We knew a Texan once who had a quick reply about the reason people call Texas “God’s Country.” “People say it ’cause it’s based on fact.” Well people pair it ’cause it’s based on taste. 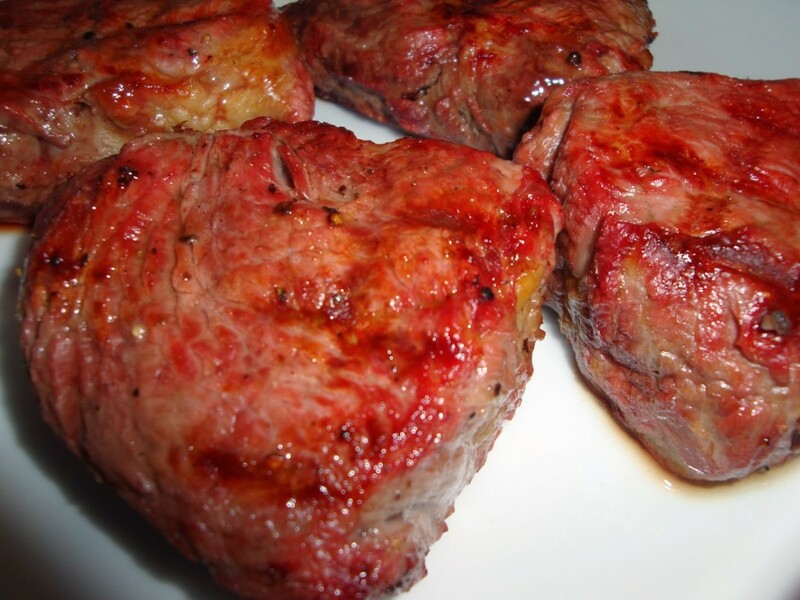 A grass fed, grass finished local cut of beef filet hits the grill and that smell of smoke and initial singe tell your nose you are in for something good. Your 1998 bottle of Cabernet Sauvignon has a cork that is both wine soaked and intact and you decant your Cabernet Sauvignon to give the air time to dance across the surface. Simple, basic, tried and true but there are lessons to be learned. And why does Tasting Pour think you should learn about pairing food and wine? So you can repeat your triumphs and avoid repeating mistakes. See Drink what you Like. 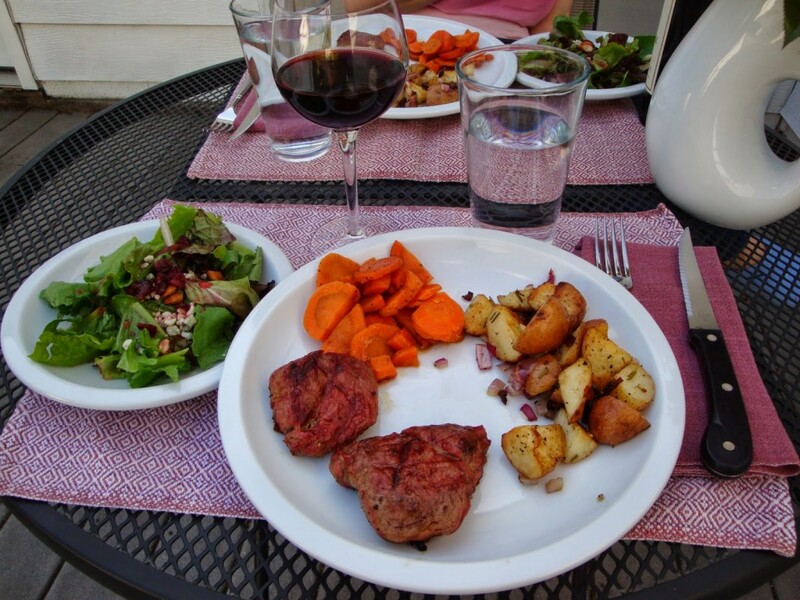 The Cabernet Sauvignon will be served with more than just the steak. 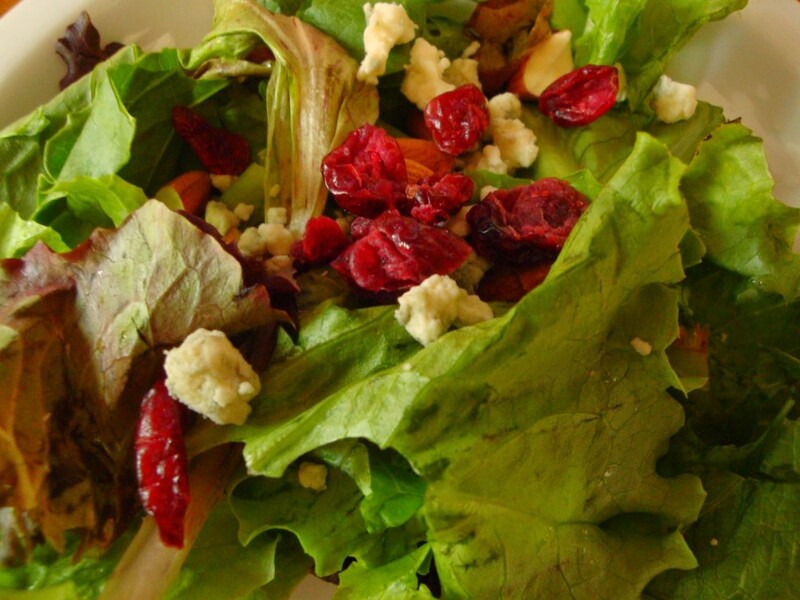 We paired a green salad with blue cheese to match the wine’s richness, dried currants to pick up the fruit flavors, and an acidic dressing for balance. Our roasted potatoes were mixed with peppery smoked bacon to compliment the grilled steak and the savory flavors in the wine. 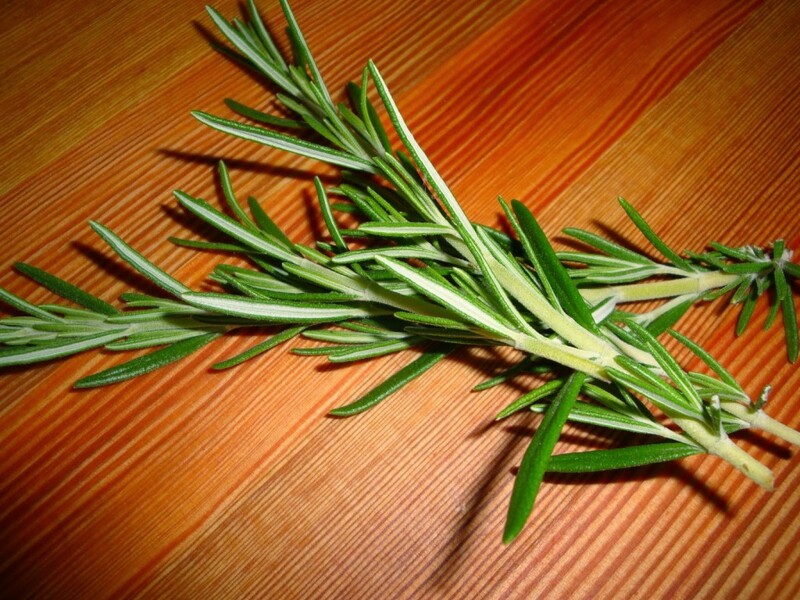 Rosemary in the potatoes highlighted the herbaceous notes often found in Cabernet Sauvignon. Steamed carrots with butter and brown sugar added a touch of sweetness absent from other parts of the meal. Because this wine had aged 15+ years we expected the tannins to be softened, the fruit flavors to be integrated and transformed to dried fruits, and a dominance of tertiary flavors like leather, meat, and earth. We stored our wine on it’s side to keep the wine in contact with the cork and made sure it was in a cool dark place. This bottle was purchased from a trusted retailer. We were rewarded with a wine that can be described as “sitting in a leather chair by the fireplace with the smells of Christmas baking in the kitchen,” In other words; leather, smoke, baking spices. Because the tannins had softened it was a perfect pairing with the more delicate filet. For more information on learning which wines to store please see our series Pour and Store here and here. 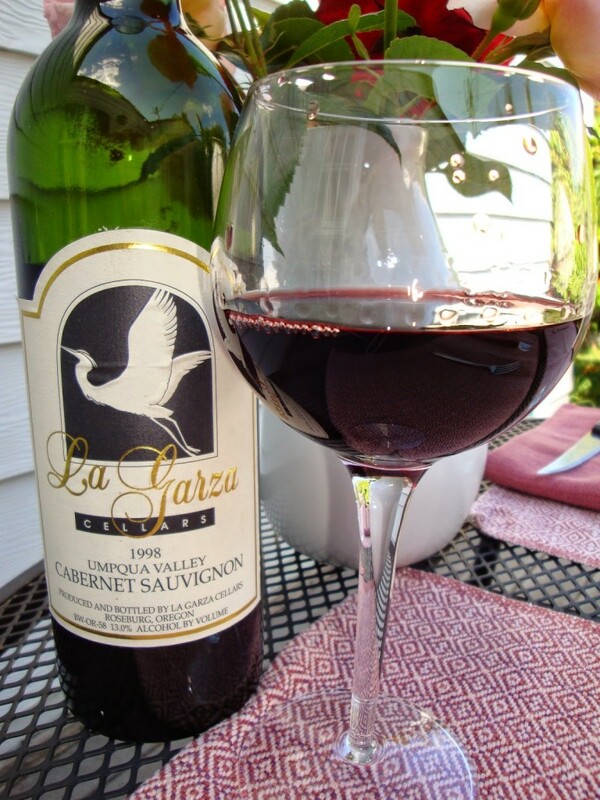 Our wine, La Garza Cellars 1998 Cabernet Sauvignon, comes from the Umpqua Valley in Southern Oregon. The area is known as “The Hundred Valleys of Umpqua” because of the diverse climates that allow for a wide range of varietals. This isn’t typical Pinot Noir country. While cooler, marine influenced microclimates exist in the northern areas around the town of Elkton, much of the Umpqua Valley is drier and warmer. Spangler Vineyards, formerly La Garza Cellars, produces Cabernet Sauvignon from ungrafted older vines (planted 1968-1971). Please share some of your wine and food pairing hurrahs or faux paus. For more wine pairing tips click here. Wine Pairing Weekend #1 Bloggers: Be sure to check out the great pairings my fellow bloggers have come up with for the first Wine Pairing Weekend! Join the #winePW conversation: Follow the #winePW conversation on Twitter throughout the weekend and beyond. You can also visit our group Pinterest board to pin some great pairing ideas for later! Stay tuned for the July Wine Pairing Weekend, which will focus on “Refreshing summer wine pairings” on Saturday, July 12. Wow, sounds like a special wine! I definitely don't think of Cab from Oregon, will have to be on the lookout to try some. Nice local pairing! I also like the way you factored in the side dishes to your pairing choice. Thanks David. Cheers to the first #winepw. Looking forward to sharing more food and wine pairing ideas with fellow bloggers and our readers. Great advice! Thanks for sharing with #winePW. I'll keep an eye out for cabs from Oregon. Southern Oregon, Columbia Valley and Walla Walla where it is warmer and drier. Cheers and can appreciate the tips you shared! Until the next #winepw.